As I mentioned previously, we did a lot of treat making this Christmas. With the exception of a few new things, we made what we made last year, despite our warnings to ourselves to go a little easier. What can we say? They all sounded so good again. Though it was a lot of work, we enjoyed the time in the kitchen together and the ability to share chocolatey goodness with other people. I mean, how can you go wrong? 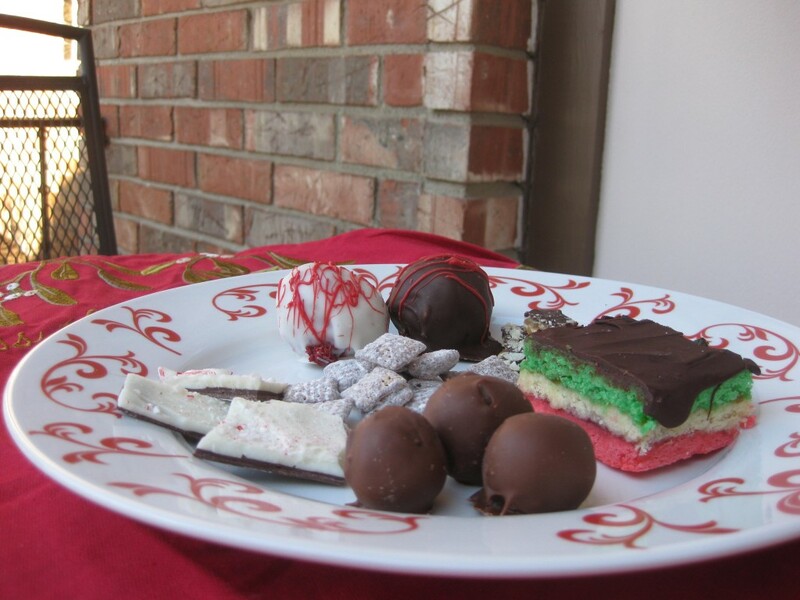 Allow us to take you on a Christmas Tour of Treats…. Clockwise starting at the back…. Cake balls – These lovely white and milk chocolate balls were an invention of pure sugar. They’re not my favorite Christmas treat, but they did end up a lot better this year than last. We were actually able to find a red velvet cake mix (apparently it’s fallen out of favor as of late?) and we used melting chocolate instead of regular chocolate bars to coat them. That along with doing them in batches made it a lot easier. I even attempted to decorate them with a little red chocolate, which I finally got the hang of towards the end. Almond Roca – This is my mom’s absolute favorite candy (well, perhaps in close running with turtles). Growing up we called it kitty litter candy, because well, the commercial version really does look like kitty litter if you think about. Nevertheless, it’s tasty, so we snagged a couple of pieces before we sent it off to her. We used the recipe I linked to, but modified it to make it more almondy and cut it in half. Next time we make it (and I’m sure my mom will make sure there’s a next time) I’ll try to post the modified recipe. Neapolitans – OMG. Where to begin with these cookies? I believe I mentioned them before since they made an appearance at our wedding reception. I don’t pick favorites well, but these cookies (really more like little cakes) have to be one of them. I’ve only known the kind of Biscotti’s at home, but I found this recipe at long last and decided we needed to try them on our own. They weren’t perfect. The colors weren’t quite right and the amount of jam was a bit too much. But still. They were delightful. Since the recipe is so tedious (it takes multiple hours over two days, even with two people on hand), we did not share many of these. In fact, we still have several in our freezer ready to thaw out when we need a sweet treat. We followed the recipe I linked to with a few alterations to make it more like the real thing. More food coloring, one layer with apricot jam and the other with raspberry and only a top coating of chocolate (3.5 oz). Will we do it again? Probably in a pinch. But nothing beats the real thing if we can get it. Truffles – We made these last year and did again this year. They’re pretty easy and always a big hit. The texture is just right and the key is to use good chocolate. Most of them were left plain (without the salt as the recipe is written), but we coated a few in coconut and some in crushed candy canes for some variety. Our technique is getting better, but next year we might invest in a chocolate dipping tool to take them up another notch. Peppermint bark – This is a favorite, ever since my BFF introduced me to it over Thanksgiving one year (and every year since then, fyi). It’s super easy, and after making it ourselves twice, we’ve managed to learn from some mistakes if you will. It’s really easy. Melt a bag of chocolate chips and add just a bit of peppermint extract. Pour onto a lined baking sheet and spread as thin as desired (we suggest pretty thin so it’s easier to break). Let that cool in the fridge. Have your husband, sister or friend crush some candy canes while you’re waiting. Then melt a bag of white chocolate in the microwave. Mix in the peppermint pieces (we didn’t do this) and spread over the chocolate mixture. Let harden and break into pieces (be careful not to impale yourself with peppermint shards during this part). 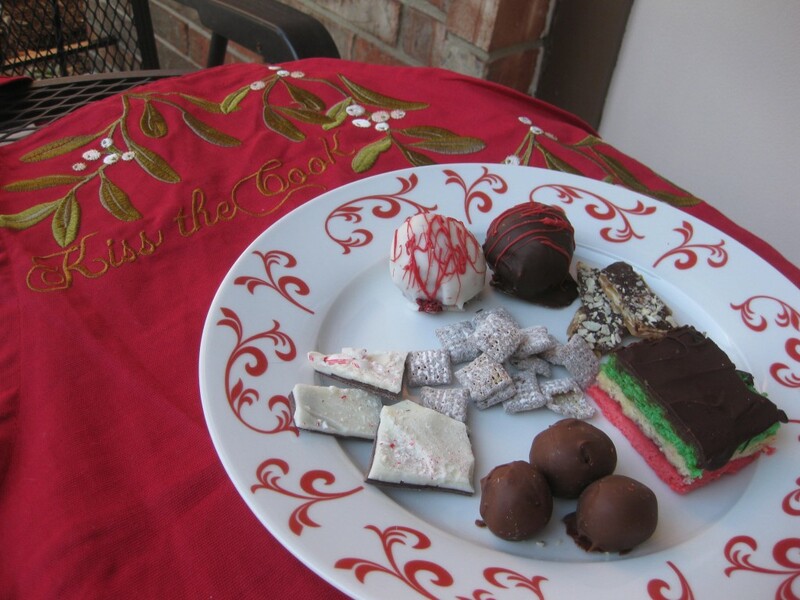 If you desire, replace the peppermint with sprinkles for a delightful sprinkle bark variation. (c; As I mentioned, we didn’t mix in the pieces, because I’m stubborn and wanted them to show more. Big mistake. The white chocolate cools too much on one half before you can get the candy cane pieces to stick. Though a hair dryer works in a pinch to remelt it just enough, it does send shards flying, so I wouldn’t recommend it. Not that I know from experience…. Muddy Buddies [Middle] – My mom used to call this white trash, but there’s another recipe called that, so that’s confusing. Apparently here in the Midwest they call it dog food or puppy chow. I’ve taken it to calling it what Chex officially calls it, so that way I can look the recipe up every year. We generally do it in half batches because we don’t have a bowl big enough for all of it. We also go a little lighter on the powdered sugar than called for so we can taste the chocolate and peanut butter a bit better. Regardless, it’s a quick and tasty treat. Peanut Butter Blossoms – I always called these peanut butter kiss cookies, but the Jif sponsored name is much more appealing. This was a special request that Chris had this holiday season, so I was happy to oblige. The ones we made were good, but we’ll probably try a different recipe next year since they turned out a bit crumbly.